Thanksgiving is for Giving Thanks. This is a great Thanksgiving book to remind kids to think about the things they are thankful for. This week, as we prepare for Thanksgiving, I am reminded of the story of two little boys who first thought to play a trick on a poor man by hiding his shoes. Then one of the boys suggested to put a silver dollar inside each shoe instead. My cousin made a video of this story that shows the Grateful response of the poor man. See the video below. It reminds me that we never fully know the circumstances of others and should look for ways we can bless others lives. We should also teach our children to look for opportunities to serve our neighbors as a way to show our grattitude for what we've been given. Read "Lessons I Learned as a Boy" by Gordon Hinckley. This is a wonderful story to share with children during Thanksgiving. 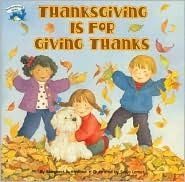 I just posted about our favorite Thanksgiving book. Of course, it doesn't teach a special lesson or anything, but it sure does make the kids collapse in a bundle of giggles.